This video shows the application of force via stretching on the hydrogels, and also outlines the overall procedures and aims of the research. Hokkaido University researchers have developed a strategy to fabricate materials that become stronger in response to mechanical stress – mimicking skeletal muscle growth. Their findings, published in the journal Science, could pave the way for long-lasting materials that can adapt and strengthen based on surrounding conditions. Hokkaido University’s Jian Ping Gong specializes in polymer science. Her research team developed a strategy employing ‘double-network hydrogels’ that emulates the building process of skeletal muscles. Applying tensile force (stretching) to the hydrogel causes some of its rigid and brittle polymer chains to break. This leads to the generation of a chemical species called ‘mechanoradicals’ at the ends of the broken polymer chains. These mechanoradicals can trigger the joining up of the monomer absorbed into the hydrogel from the surrounding solution into a polymer network, strengthening the material. A double-network hydrogel (i). After stretching (ii), brittle sections break, allowing a generation of mechanoradicals, indicated by color change (iii). With successive stretching, more breaking down and building up occurs, similar to what happens with skeletal muscles undergoing strength training. Through this process, the hydrogel’s strength and stiffness improved 1.5 and 23 times respectively, and the weight of the polymers increased by 86%. The team was further able to tailor the material’s response to mechanical force by using a specific monomer that altered the gel’s reaction to heat; heated at high temperatures, the gel’s surface became more water-resistant. 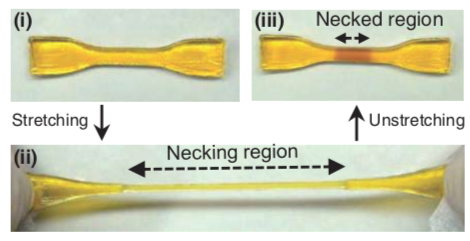 This image depicts the process in which double-network hydrogels were stretched, leading to the strengthening of the material. Citation: Mechanoresponsive self-growing hydrogels inspired by muscle training.